But I’m going to, anyway. 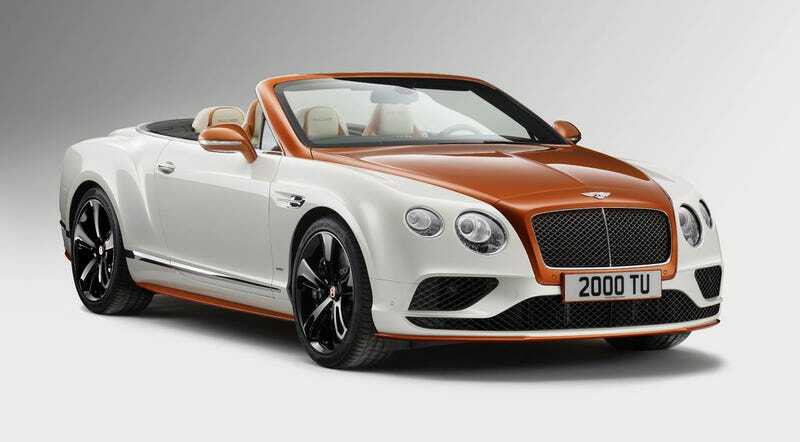 This is the “Orange Flame” Bentley Continental GT V8 S specially designed for the 2016 Geneva Motor Show by Bentley’s Mulliner coach program. It’s an inverted creamsicle, and it’s dumb. Unfortunately the creamsicle color pattern melts into the interior too, all the way down the clock costing thousands of dollars and even a custom carbon fiber weave. I get that you’ve got money to spend, but why are you spending it on this? This two-tone job, in any color combo, wouldn’t work. Making it look like a melty, creamy ice cream sort of tarnishes the 520 horsepower V8's potential to be cool. Benltey’s spectrum of cool-to-not-cool is too damn wide. On one end you have Idris Elba breaking speed records and James Bond driving one in the novels, and on the other end sits a sub-par ice cream. But whatever, man. It’s already been sold for an “undisclosed price” that was too damn much.